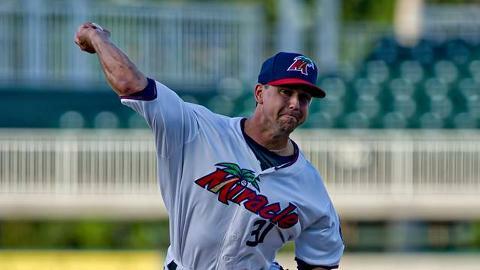 FORT MYERS, Fla. - Alex Kirilloff went deep for the third time in five games, and Andro Cutura allowed one run in seven innings, as the Fort Myers Miracle opened the South Division Championship Series with a 3-1 win over the Palm Beach Cardinals on Tuesday night at Hammond Stadium. The best-of-three series now shifts to Jupiter for Game two on Wednesday night. Kirilloff's first inning blast gave the Miracle an early 1-0 cushion. They took a 3-0 lead in the third with consecutive two-out run producing hits. First, Ryan Costello dunked one into left to score Lewis, before Jose Miranda doubled off the wall in center to plate Costello. Palm Beach scored their lone run in the fourth after the Miracle could not turn a double play on a ground ball to short. Cutura (1-0), who pitched to an ERA below 1.00 in August, continued his run of dominance. The right-hander scattered four hits and struck out nine. Ryan Mason earned the save with two scoreless innings. Mason escaped first and second and no out trouble in the ninth with a double play and a strikeout.